Shou Tucker has brought Al down into a basement. He wants to bring back Nina, but he needs the help of the philosophers stone. Oddly enough, this deformed man seems to know about everything that is happening....including the Fuhrer being a homunculus.�It seems Tucker learned much from his time in the 5th laboratory and that includes who was really pulling the strings. He agrees to teach Al how to use the stone, providing it's used to bring back Nina. Equivalent trade...right?! Ed and his Sensei are discussing Dante and her strange behavior. She shows the boy a love letter written to Dante dating back 400 years. Ed is shocked. Could this mean that it is actually Dante that is controlling all of the Homunculi? Not long after their conversation, Ed leaves, but not before apologizing to his Sensei. Back in Havoc's hospital room, Colonel Mustang is setting his plan in motion. Fuery is told that he will become a roommate to Havoc. Mustang strips the young soldier of his glasses and tries them on Hawkeye. Once the troops have left, the Fuhrer returns to his office. He opens a hidden door and takes an elevator down quite a distance. There he meets up with Lyra (who is now Dante). Her plot is to have anyone involved with Hughes to be killed in action by the devious Envy. Speak of the devil....Envy comes walking through the doors looking for Hohenheim. He is violently angry. It was Hohenheim who created the boy and then abandoned both him and Dante. When he is told the man is dead, only the knowledge that he can seek revenge on the man's sons (who have the philosopher's stone) calm him down. Lust, Sloth, and Wrath have found the room where Al was supposed to hide out. They see the note left for Ed. Sloth leaves to face Tucker, while Lust and Wrath wait for Ed's return. In Tucker's laboratory, Al has etched all the transmutation symbols needed for Nina's resurrection. The man-beast has Al step in just the right position causing Al's armor to illuminate. Before the boy is ready, Tucker performs his transmutation. Ed has returned to the room only to find an ominous welcoming party. He is able to hold off Lust with the pendant, but Wrath's attack has left Ed without the hand part of his automail! Knowing their scuffle has taken a bad turn, Ed jumps through a window into an alleyway. Lust and Wrath follow. Wrath insists Lust kill the boy, but Wrath instead asks Ed if he would make her human. Wrath is furious at his traitor partner and immobilizes her with the pendant he had grabbed while in the room. Before the young humunculus can do anything, Ed uses alchemy to fight him off and now Ed has taken the pendent. Lust is able to get free and makes sure Wrath is off their backs by piercing the non-human boy in the head. They run towards Tucker's laboratory hoping to catch up with Sloth. The next scene shows Tucker happily talking to his daughter. Al wakes and notices the man is talking to a soulless young human. Slowly solidifying, Sloth appears before them. Tucker cringes in terror. She turns to Al instructing him to come before more of the stone erodes. Al looks down at his armor in disbelief....it's eroding! Picking up from last episode, Sloth pretends to sooth a frightened Al. Her words trigger flashbacks of his kind, gentle mother. Not too far off, Wrath experiences the nightmare of the dark gate. He regresses down to an infant and is nurtured by Izumi, however, he envisions the woman to be Sloth. When he fully awakens, Wrath sets out to find his mommy. Sloth convinces Al to accompany her and puts a stop to the begging Tucker (don't worry, she doesn't kill him). When the two exit the basement of the factory, they are met by an angry Ed. "Homunculus, let go of Al!" he says furious. Although Al protests, Ed is able to trap Sloth in the same transmutation circle that killed Greed. He takes what he acquired from Trisha Elric's gravesite and shoves it into her body. Sloth is reduced to an eerie liquid unable to free herself from the transmutation circle. Lust walks out from the shadows. How surprising to discover that the etchings in the circle were done by Lust herself! For her troubles, Ed returns Lust's pendant, but she tosses it away saying that's not why she helped him. When Sloth asks why the betrayal, Lust admits she has memories of life and reveals she was a woman from Ishbal. Seeing that homunculus are able to experience human emotions, Al grabs the small box holding part of their mother and throws it out the window. While Sloth coughs up fragments of the red stone, the two boys argue whether they have created a human or not. Ed insists they must destroy the homunculus. Lust says she'll make sure Sloth stays put until Ed is able to retrieve the box. Outside the building, Ed encounters Wrath. The young homunculus absorbs the box into his own chest and proceeds to fight with Ed. They crash through the window back into the factory. Wrath sees Lust repeatedly attack Sloth and angrily sets out to protect who he believes is his mother. As he is attacking Lust, Sloth is able to get free by pouring herself (get it (^_^)) into Al's armor. She takes control of the metal boy. Lust tells Ed to take care of Al while she faces Wrath. The two homunculus have at it. Oh NO! Wrath has found Lust's pendant just as she is standing on the transmutation circle meant for Sloth. Wrath grins as he performs the alchemy that could destroy Lust for good. Meanwhile Al is unable to control his body and is attacking Ed. 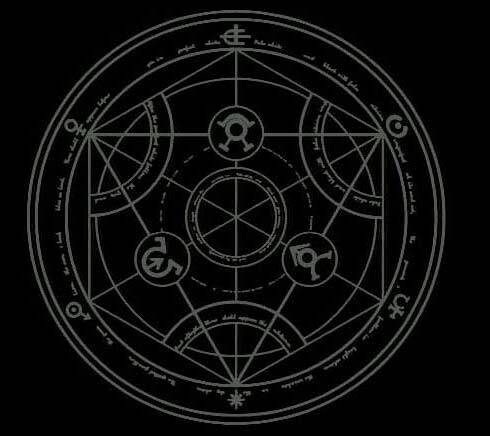 The older boy tries to avoid the attacks and in the process create a transmutation circle. To complete the circle, two desks must be pushed together. Ed and Al combine the desks and perform an alchemy that freezes Sloth. Meanwhile, Lust is close to death. She now is vomiting the red stones. "Isn't this what you want? You wanted to become human so you could die, didn't you?" Wrath asks ominously. Just as Lust begins to realize what he says may be true, Wrath finishes her off for good. The next scene returns to the boys. A frozen Sloth tells them what happened to her after the fateful night they performed the forbidden. Severely deformed she was found by Dante and fed the red stone until she took a more human form. Pride then manipulated the records so she could infiltrate the military working for him. After telling the story, she generated enough heat so that she could solidify outside Al's armor. She lashes out at Ed. Wrath comes through the door just in time to see Sloth reduced to rain. Ed alchemized his automail into sodium by creating a reaction with the water, and it caused an explosion. Just when you think you've seen the last of her, Wrath screams for his momma and the beautiful Sloth forms once again. "Momma, I want to become one with you!" Wrath cries. He fuses himself to Sloth using the box he had absorbed and now the two can't move. This gives Ed the chance to do what he intended. He reconstructed all of the water molecules within Sloth to ethanol. She will now evaporate by herself. Both Wrath and Al are devastated. Wait a minute. Someone was watching all this. The troops in the North are becoming restless. They are shocked when Armstrong informs them that they will return to Central and take over. "Are you going to oppose the Fuhrer without evidence?" they question. Of course, Armstrong displays his muscular physique as the only evidence that is needed. In the abandoned factory, Wrath breaks down in tears after Sloth evaporates. Ed and Al hang their heads in sorrow until they hear a familiar voice. It's Winry? Ed isn't fooled. It was really Envy posing as their friend. The shape shifting homunculus takes Al. Unfortunately, Wrath has made it impossible for Ed to stop Envy. The younger homunculus is bitter at the loss of his mother. Just as he is pummeling Ed, Izumi shows up. "I don't give a sh** about you....you're not my mommy," Wrath cries running away. Izumi helps Ed up...she has come to help. Meanwhile in Central, Russell Tringham wants to purchase some books, but he is short on cash. When the owner says that they only cater to Nationally Certified Alchemists, Russell says that he is Edward Elric. Uh Oh! Bad Move.... Before they know it, the two brothers are captured and thrown in Central's jail. Returning to Ed and his Sensei, they see the pendant and know that Lust is gone. That leaves only four homunculus. Tucker is there as well. He is rambling to his soulless child. Ed says that is the price he must pay for his sins. Izumi looks at Ed, "You have become an adult," she says. The two agree that they must take care of the remaining homunculus whose whereabouts are known....the Fuhrer King Bradley. Up North, the military stands divided...those behind Brigadier General Mustang and those opposed to fighting against the Fuhrer. Suddenly Havoc pulls off his disguise. Seems he has been posing as Mustang. What's even more funny is Fuery was posing as Hawkeye. Back at the hospital, Mustang and Hawkeye get their plan into motion, while at Central the General is preparing the whole Army to catch up to Mustang's troops. The Fuhrer knows that a rebellion has started. He is also told that two boys posing as the Elric brothers have been captured. He orders his men to dispose of them. The scene switches to Russell and Fletcher. The Tringham brothers have an important paper from their father's diary that they want to give to the real Elric brothers. As they are talking footsteps are heard outside their jail cell. It's Lieutenant Ross and Sergeant Brosh. In a small tavern not far from Headquarters, Mustang meets with the architect to discuss the Fuhrer's home. He is given the layout of the home while giving some fictitious story. After their meeting, Mustang changes into civilian clothes and informs the disguised Hawkeye that today may be their only chance. Hawkeye must give him bad news...there's a rumor that the Elric brothers were captured. The alarms sound at Central indicating intruders. It's Izumi and Ed. Both are furious to learn that the Fuhrer went home early for his son's birthday. Now they're forced to flee from dozens of armed soldiers. As they are doing so, thick branches pull them into a room just before the entrance disappears. It's the Tringham brothers along with Ross and Brosh. The two had saved the young brothers from execution for they believed the punishment was too extreme. As soldiers look for their whereabouts, Ed says they must leave for the Fuhrer's home. Fletcher hands Ed the papers from his father's diary. Just as they are reading some shocking information, a deformed and now mechanical Archer bursts through the wall. He is a one man weapon of mass destruction and he's hiding nothing (ha, ha, just had to say that). Sensei tells Ed to go to the place in the diary while she takes of Archer. In a car outside, Mustang and Hawkeye see the commotion inside the building. Figuring the boys are alright they attempt to drive off, but Ed jumps in front of them. Imagine his surprise to see that it is Mustang. They drive together to Wag District where the Fuhrer's home is. On the way they discuss their intentions and how they conflict with their dreams and true ambitions. When Mustang drops Ed off at his destination, the two bid each other goodbye knowing that it may be the last time they see one another.